Data management platforms (DMPs) and retargeting systems are go-to tools for many marketers, and with good reason: they’re good at what they do. But your work doesn’t end there. 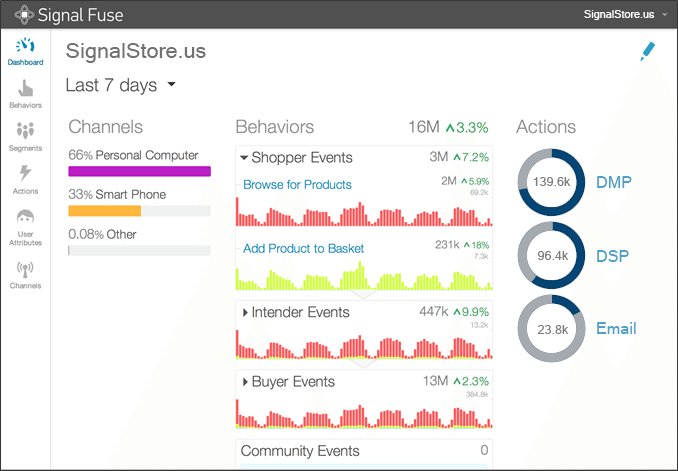 To help you get the most out of the technology investments you’ve already made, we have created Live Segments, a recently-released feature of Signal Fuse, our real-time, cross-channel platform. Live Segments combines sophisticated, DMP-style segmentation with the real-time capabilities of retargeting to create something very powerful. In Live Segments, Signal does away with the notion that the system has to store all the historical behavior data of the user, and instead focuses on what users are doing in the moment. Signal allows marketers to create new segments on the fly, and take action with users immediately. Signal’s platform collects live user behavior data via tag management, API, point of sale, or SDK integration. Data then flows through a segmentation system where CRM data can be added and used to make additional segmentation decisions. Within milliseconds, data is passed directly to one or more marketing technology partners like demand-side platforms, mailing platforms, analytics systems, and DMPs. Live Segments offers a complete solution for advanced segmentation using live customer data – based on what customers are doing right now in any channel or on any device. It offers a deep understanding of user behavior and gives marketers the ability to act on insights in real time. Live Segments features a sophisticated rules system allowing customers to combine real-time behavior traits with stored CRM user attributes. For example, someone browsing a product might trigger a rule because she is a Gold Level Member. This can instantly trigger a custom advertising message featuring not only the product she was perusing, but also that she is a Gold Level Member. You might add conditional rules that take into account how long she’s been a customer and whether she abandoned her shopping cart, and email a coupon as an incentive. Above you can see a view of the Live Segments dashboard. By grouping behaviors, it gives marketers a bird’s eye view of the Sales Funnel. These groups can be customized to handle a variety of conversion progressions and behaviors from different channels. The dashboard also features inbound Channel activity from web, mobile, API, and even point of sale systems. Any of these channels can trigger a segment to fire Actions, which are featured on the right side. The dashboard behavior groups expand to reveal each behavior for deeper inspection. This flexibility allows marketers to gain insights into the impact of their efforts. In delivering on the promise of real-time marketing, Signal’s Live Segments gives marketers the tactical insight into their day-to-day operations—and it represents the next evolution in marketing technology. To learn more about how about Signal Fuse and Live Segments can help you get more out of your data, click here to request a demo. Mark McEachran is Director of Products at Signal.